GOLD CUP RACE DETROIT photo picture print for sale of MISS BARDAHL Gold Cup Race Winner - Detroit Gold Cup MISS BARDAHL U-40 Hydroplane Race Belle Isle historical photo picture for sale - MISS BARDAHL U-40 Detroit Gold Cup Hydroplane Race Winner 1964 photo picture print for sale - This previously unpublished historical color photo was made from a black and white photo THAT HAS BEEN HAND COLORED by noted American artist Jan Kaulins. Historic Gold Cup Race Belle Isle Detroit Unlimited Hydroplane photo picture art print- 1964 Detroit Gold Cup Race Winner MISS BARDAHL picture photo print. This Historic vintage Detroit Belle Isle July 5, 1964 APBA Gold Cup Race photo was hand-colored and printed by Jan Kaulins. The original photographer is unknown. 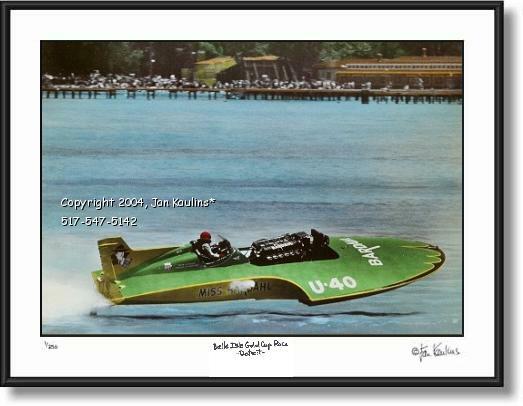 This excellent and rare Detroit Gold Cup Race photo pictures Miss Bardahl powered by a Rolls engine and driven by Ron Musson, bearing the famous U-40 lettering skimming the surface of The Detroit river on the way to winning the 1964 Unlimited Hydroplane Gold Cup Race by one second. This was the 2nd year in a row that Miss Bardahl, driven by Musson, won the race, and the following year, 1965, Musson won The Gold Cup again, becoming the first racer and boat to win three Gold Cup championships in a row since El Largato did in 1935. Tragically, Ron Musson was killed the following season while driving a radically altered Miss Bardahl at the 1966 President's Cup Race in Washington D.C.
From 1961 to 1966 the combination of Ron Musson and 'The Green Dragon' Miss Bardahl, would go down in history as one of the Unlimiteds racing "dream teams." In 1993 Ron Musson was inducted into the Motorsports Hall of Fame in America. This is a rare opportunity to own this previously unpublished hand-colored historic Detroit photo of legendary Miss Bardahl and Ron Musson winning The 1964 Gold Cup Race in Detroit, Michigan. Miss Bardahl won more races (24) in the decade of the sixties than any other team. Between 1957 and 1969, Miss Bardahl accounted for 27 race victories, five Gold Cups, six National Championships, and was the first to average 116 miles per hour in a heat of competition (in 1965). Miss Bardahl is a 30’ long, 7000 lb unlimited hydroplane race boat. Powered by a 3,000 HP Rolls-Royce Merlin aircraft engine, this craft is capable of speeds in excess of 180 MPH while literally flying across the surface of the water on a cushion of air. With only three points – 1 propeller blade and the two sponsons – touching the water at any time, Miss Bardahl leaves a “roostertail” of spray over 40 feet high when speeding by. Racing between 1962 and 1965, the team won an unprecedented 3 APBA Gold Cups, 3 National Championships, 1 World Championship, set lap, race and heat records (some which stood almost a decade), and introduced new technology that revolutionized the sport while running a record 57 consecutive heats without an engine failure. THIS HISTORIC MISS BARDAHL 1964 GOLD CUP RACE PHOTO IS FOR SALE ONLY FROM THE DETROIT PHOTO GALLERY ON THIS WEBSITE. CLICK ON THE LINK BELOW FOR PRICES, SIZES AVAILABLE AND ORDER INFORMATION. Please click on the link below to see prices, sizes available and order info. of this 1964 Gold Cup Race winner Miss Bardahl color photo made from an original black and white photo. TO SEE THE MANY OTHER HISTORICAL AND CONTEMPORARY DETROIT PHOTOS AVAILABLE FOR SALE ON THIS WEBSITE, please click on the 'Home - Return to All Galleries' link beneath this paragraph, and then click on the 'Detroit Photo Gallery' icon link.